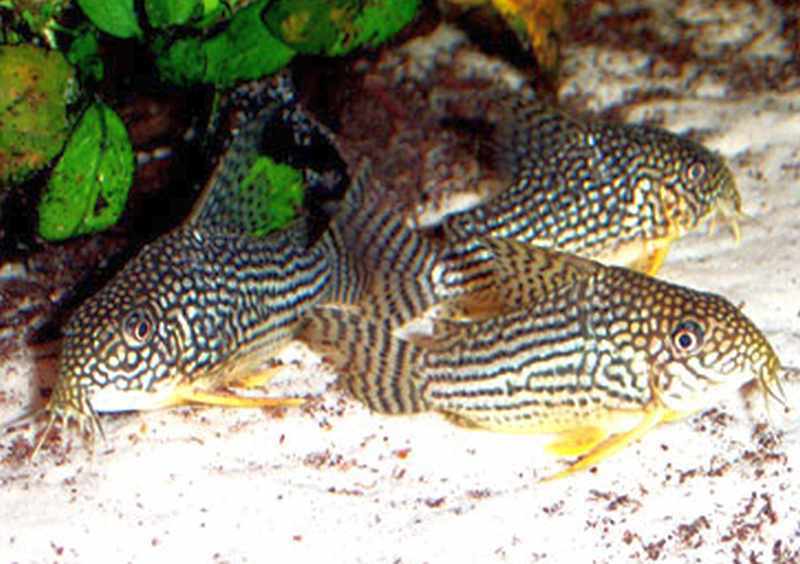 Sterba’s Cory Cat (Corydoras sterbai) is also known to tropical fish keeping enthusiasts as Sterba’s Cory, Sterbai Cory, or Sterba’s Corydoras and is found in the small tributaries, pools, creeks and flooded forest areas of the upper Rio Guapore in Bolivia and Brazil, South America. Sterba’s Cory Cat (Corydoras sterbai) is one of the two more common species of Corydoras that have spotted bodies and bright orange fins. 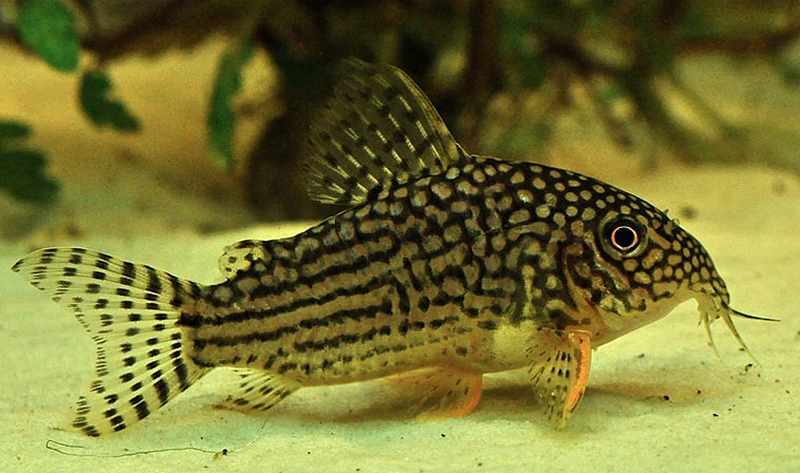 Sterba’s Cory is a peaceful bottom dwelling catfish that is frequently misidentified as Schultz’s Cory (Corydoras haraldschultzi), which has a lighter body background with darker spots and a more elongated, snout like head. Sterba’s Cory has a round head with lighter spots on a darker background. Sterba’s Cory Cats prefer a densely planted tank with a dark colored, sandy or fine gravel bottom substrate, some driftwood or bogwood roots, and plenty of swimming space. They thrive in clear water conditions with a moderate amount of current in their tank and like most other species of Corydoaras, do best in small groups with their own kind. Sterba’s Cory Cats can be kept in most planted South American community tanks with other peaceful species of tetras, danios, rasboras, livebearers and rainbows. They enjoy having broad leaf plants (Amazon Swords ) and crevices under rocks or bogwood in their tanks for hiding places, but it is best to avoid substrates with sharp or jagged edges that can damage their sensitive barbels and undersides. Fine sandy substrates are best for this species. 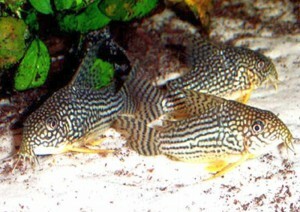 The Sterba’s Cory Cat is one of the easiest Corydoras species to spawn and is recommended for beginning tropical fish keeping enthusiasts. Set up a breeding tank with either a bare bottom or fine sand substrate, a “seeded” air powered sponge filter, and some Java Moss or a fine spawning mop. The eggs seem to be less susceptible to fungal diseases when kept over a thin layer of sand rather than in a bare bottom aquarium. The tank water should be kept at about 75 degrees F. with a pH of 6.5. Place two conditioned males to each female in the breeding tank and when the females become visibly gravid, perform 50% to 70% daily water changes with cooler water and increase the oxygenation and current in the tank until spawning takes place. During breeding, the male will clamp the barbels of the female during the fertilization process between his pectoral fin and his body. Once fertilized, the female will then carry the eggs to their final destination (usually a plant leaf, the side of the glass or other smooth surface) using a special pouch located under her ventral fins and the process is repeated until spawning is completed. At this point either remove the adults from the breeding tank or remove the eggs to a brooding tank that is well oxygenated with a moderate current. After 3 to 5 days the eggs will hatch out and after the eggs sacs are absorbed, the fry can be fed microworms, microplankton, or newly hatched baby brine shrimp until they are large enough to eat prepared foods. The Sterba’s Cory is omnivorous and should be fed a well balanced diet that includes live, frozen, sinking pellets, flakes, and freeze dried foods such as brine shrimp , freeze dried bloodworms , chopped worms, etc. Corydoras sterbai are usually readily available for purchase when they are approximately 3/4″ to 1″ in size.